Hello, dear neighbors ! I am posting this recipe not knowing if you will be able to find the « star ingredient » in this savory pie. I am talking about anchovies, but not the kind that comes as very salty flat fillets (much too salty for my taste) and that often garnishes pizza. These anchovies are canned just like sardines and almost taste like them. I said « almost » : they are milder and, sorry if I am a little graphic here, they do not keep coming up for air after you have eaten them ! Some guests are more discreet than others, right ? Anyway, if you find them in your local store, please make sure they are free from preservatives, coloring, and flavoring ! Mine come kept in a little olive oil and salt. Very tasty ! 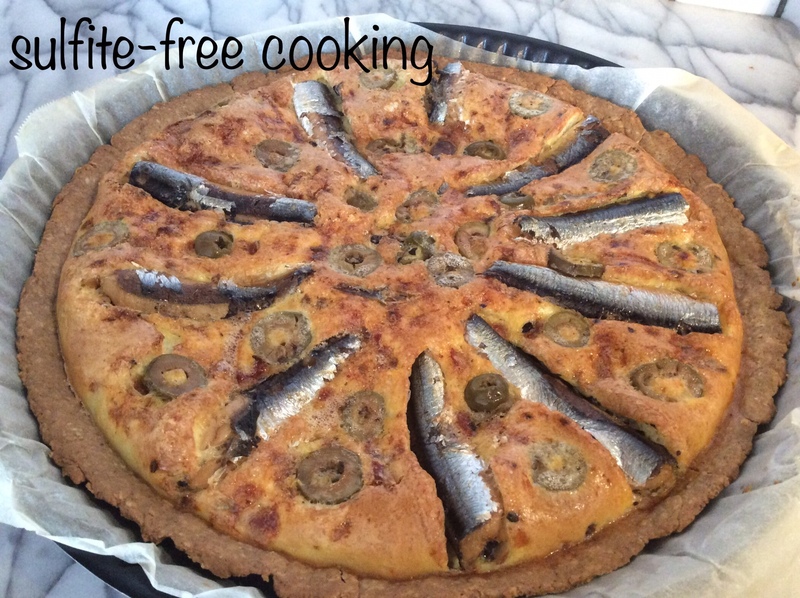 And they are not available where you live, you can always use plain canned sardines instead, with the same free-from requirements. – 30 g / 1 oz green olives ; mine are bought in the bulk section of my organic food store ; they are usually preserved in nothing but oil and a little salt. When in doubt I ask to read the ingredient list on the original package. My husband avoids going shopping with me for this reason : I always ask if I am not sure, which makes him feel very self conscious, as though he was the problem ! 1. Roll out the dough onto greaseproof paper and place on pie dish. Pre-bake for 15 minutes. 2. Meanwhile, beat eggs. Chop sun-dried tomatoes in tiny chunks and add to beaten eggs. If you would rather use tomato paste, you may need to add a little salt to your preparation, but not much, as the fish and olives do have some already. 5. Pour egg mixture over pre-baked pie crust ; place fish halves then olive slices. 6. Resume baking for another 20 minutes at the same temperature. Enjoy, dear neighbors, and have a nice Easter !